The current orbit of ARISSat-1 has it exiting the eclipse over the northern hemisphere and thus does not become active until it reaches the lower latitudes. This means it should be fully active for the southern hemisphere during the day and part of the evening (until it enters the orbital eclipse). This image was recently captured by ZS6BMN. 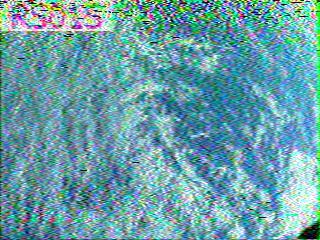 W8ZCF and KB8VCO were successful in transmitting a picture and receiving back an image via the ARISSat-1 transponder. 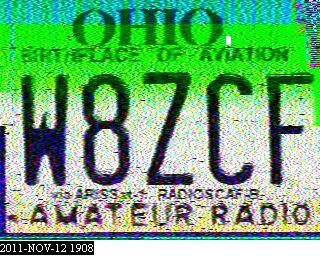 This image of a license plate was received on November 12, 2011 at 1908 UTC. This image received by EB3SA over Europe looks more like a scene from a science fiction show or painting. The image captures the sun as it is rising over Europe and welcoming a new day. Some postings are beginning to speculate as to when ARISSat-1 will re-enter but the guesses are still pretty wide. They range from December 2011 to April 2012. Should be interesting to see if it transmits any images just prior to burning up. 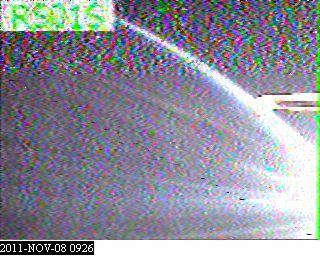 This image is not the highest quality one we have received but it is very interesting from a technical standpoint. 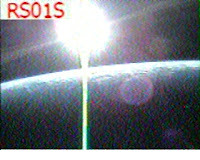 This image was captured by PY4ZBZ and had a time stamp of 0926 UTC. It shows the edge of the Earth illuminated by the sun that has just risen over the horizon. Most of the Earth is still in darkness at this time. ARISSat-1 should have become illuminated about 0911 UTC. Given the time necessary for the system to activate and clear the safety timer (about 14 minutes) the earliest transmission would have been about 0925 UTC. That probably means this is one of the first images the on board cameras took shortly after entering sunlight. 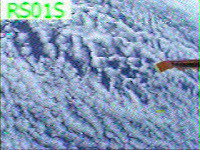 The image was then transmitted just after the transmitter went active and subsequently captured by a ground station (PY4ZBZ). 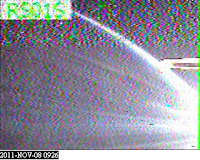 Okay, a little luck played into all that technical execution but it is still fascinating knowing what went into capturing this image as ARISSat-1 transitioned across the terminator at an acute angle. 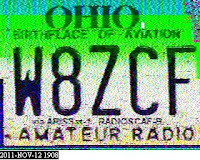 We start over today for the collection of initial images to be displayed on the AMSAT Gallery. This very nice image of some clouds was our first for the month and received by JAøCAW. I hope we will have even more to choose from this month with the satellite entering a period of greater illumination.